If you love eating and drinking for free and are looking to make some pocket change, there’s a job in China with your name on it. A new type of online service allows people to hire others to eat or drink their favorite treats, either to cure their boredom or satisfy their craving without the calories that usually come with it. 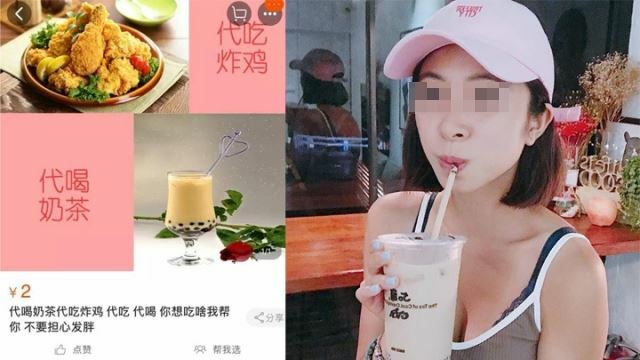 Chinese media recently reported on an increasingly popular service on online commercial platform Taobao that’s as mind-boggling as it is intriguing. People can now go online and hire others to consume certain foods and drinks, and ask them to provide video evidence of them eating or drinking the said treats. Fees usually range between 2 yuan ($0.30) and 9 yuan ($1.35) plus the cost of the food that the client wants consumed. It’s not exactly a get-rich quick kind of job, but there are quite a lot of people willing to do it for the free treats alone.